Yesterday while I was slaving away in the Computer Mine, I came across something curious. While it is true that I frequently come across something curious in the Mine, this seemed to be a different kind of strange. I concede that very few people at the Computer Mine are getting filthy rich, but I doubt that anybody that works here is in such dire financial straits that they desperately need that one quarter. It turns out though that my initial inclinations about this note were wrong. I thought Judy had found an extra quarter in the change slot of the vending machine and taped it up, in case somebody came back looking for their quarter. 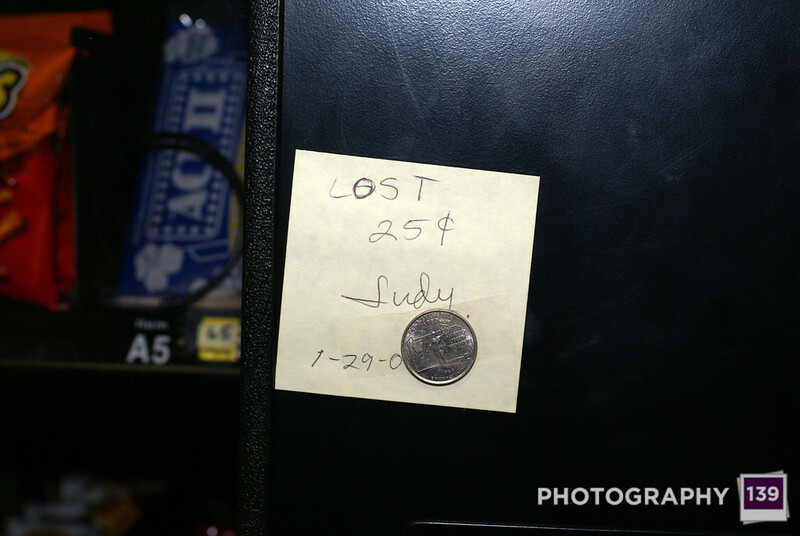 In fact, Judy just posted the note because the vending machine had stolen her quarter. Jesse saw this note, went back to his office, grabbed a quarter, went back to the vending machine and taped a quarter to the note. I guess in the future, any time that gas prices are making me feel pain in my wallet, I’ll just post a note on the vending machine asking for like 50 bucks. Maybe somebody will tape up some cash for me. Although there has to be an easier way to financial security. If only there was some church out there that would send me a prayer rug that I could use and then fill out exactly how much money I want God to give me and then send them 50 bucks and then God would just give me that money. If only there was something like that out there.